Field – 51 teams of one Pacific Northwest PGA Professionals and one amateur. 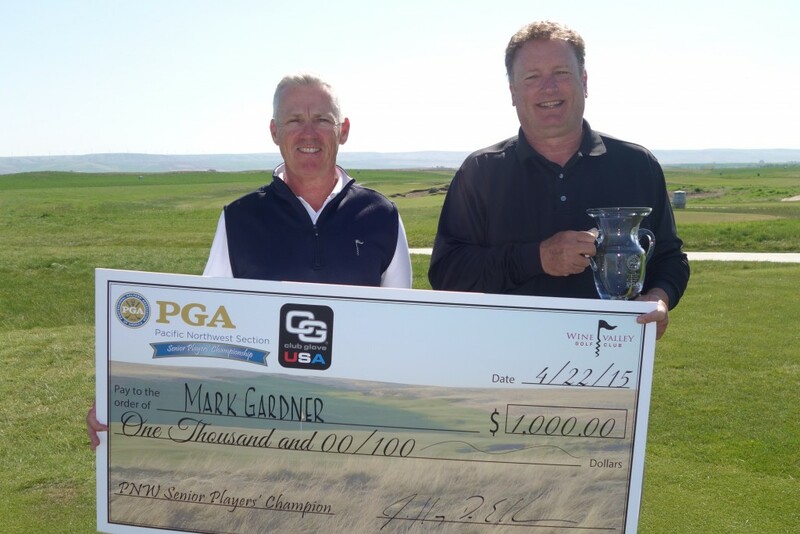 PGA Professional Mark Gardner of The Creek at Qualchan won the PNW Senior Players’ Championship after firing rounds of 64-71-135 to win by 2 strokes over PGA Professional Mike Gove of Inglewood GC. PGA Professional Mark Keating of Pumpkin Ridge GC took third place. Ed Jonson of Wing Point G&CC took low amateur honors after finishing in a tie for fourth place with PGA Professional Tom Sovay of GC at Redmond Ridge and PGA Professional Billy Bomar of Prairie Falls GC. Winning the team Four-Ball competition is the team of PGA Professional Mark Gardner and his amateur John Lefriec, PGA Professional Billy Bomar of Prairie Falls GC and amateur Mike Kerns and PGA Professional Mark Keating of and amateur Mark Bowler. Congratulations to PGA Professional Lon Hinkle of Eagle Bend GC who make a rare double eagle on hole #7, a par 5 on Tuesday. He dunked a shot from 252 yards with a 20 degree hybrid. Congratulations also to amateur Keith Crimp of Ellensburg G&CC for making a hole-in-one on the 11th hole. He hit an 8 iron from 155 yards. The Senior Players’ Championship welcomed PGA Professional Ken Allen and Club Glove to the event this year as a sponsor. Ken was on site at Wine Valley to meet each participant and hand out a tee gift. CLICK HERE to view the Senior Players’ Championship final results. WINE VALLEY GC – Wine Valley Golf Club, which opened in April of 2009, has been rated 5th on Golfweek’s Best New Courses. To produce Golfweek’s Best New Courses list, a nationwide team of more than 475 evaluators rated the layouts on the basis of 10 criteria, including routing, conditioning, variety and memorability of holes. The result is an average of scores, which then dictates a course’s overall ranking. This stunning Dan Hixson design unfolds on a grand scale, playing over rolling hills in the shadow of the Blue Mountains. Wine Valley GC has broad fairways, dramatic bunkers, and bold, undulating putting surfaces.